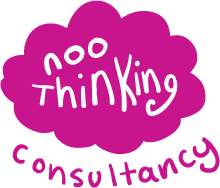 Noo Thinking is a consultancy, based in South London. Noo Thinking helps schools, individuals, organisations and businesses to be highly performing by empowering people to work well together. Effective work and change management practices build high impact, happy teams; retain good staff and drive up performance. Achieving and maintaining effective work and change management practices can be challenging. Sometimes, we are so busy meeting deadlines and spinning plates, that we don’t set aside the time to induct, monitor, review , resolve conflicts, evaluate, reflect and accurately action plan. We may not take the time to assess the experience and engagement levels of our staff. Lack of reflection and evaluation can mean that work practices such as celebration and reward of high performance, having key conversations or offering incentives, negative environmental impacts, ineffective communication and work streams, lack of targeted training and support are not reviewed and discussed; often with the high associated costs of losing good staff. It can also lead to missed opportunities to accurately plan actions to address underperformance, resolve conflicts in relationships, make environmental changes, and target support and training for staff. Lack of rigorous compliance can also negatively impact performance. Noo Thinking is currently busy helping with GDPR training and compliance. Delivering a quality product or service, in an affordable and sustainable way. Routinely applying good finance, liability and insurance systems. Being committed to their product or service offer. Effective marketing; ensuring that those who need their product or service, know about them. If you would like to discuss any aspects of good working practices, why not book a free, initial consultation and let us help you. Please get in touch.